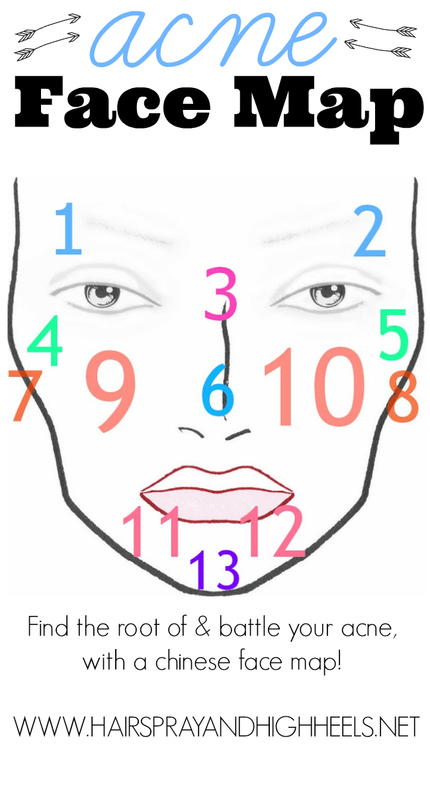 Face Mapping is a type of chinese medicine used today to around the world that explains how and why certain parts of your face that have acne are actually connected to other parts of your body. Have you ever wondered if your acne was trying to tell you something? With an acne face map you have the ability to find the root of the issue and along with topical treatments and cleansers combat the acne problem at home. Acne Face Maps are the new thing in most spas and dermatology offices across the country. By looking at the acne face map and figuring out where your breakouts happen most often you can diagnose other issues and implement practices into your everyday life that will help you target and get rid of acne. I was first introduced to an acne face map when I went to get a facial at my favorite spa. They asked where I broke out most often and worked on those areas, and gave me some tips and tricks to target and get rid of acne. I want to share that and some further research I have done with you. This way of looking at my acne has helped me tremendously with dealing with my breakouts, sometimes topical treatments just don’t work and we can’t blame everything on the once-monthly crazy hormones. The skin is the largest organ on your body and you should absolutely listen to your skin when it comes to checking on other health issues. What’s happening on your face can be very telling to what is going on in your life and your health. ZONE 1 & 2 – DIGESTIVE SYSTEM – If you have frequent breakouts in this area it may mean that you need to drink more water and start eating more “whole” foods as well as get more sleep, try going to bed earlier and keeping yourself on a balanced sleep schedule. Breakouts in this area could also be from the consumption of to much alcohol. Other things you can do is try and eat less fatty foods and walk more to get your circulation going. ZONE 3 – LIVER – Breakouts in this area could be from over consumption of alcohol and fatty foods like in Zone 1&2, try drinking more water and eating healthier. This could also be from a food allergy, do you know if lactose intolerant? Breakouts in this area could be a sign of that. Cut out the greasy food, excess alcohol and get some exercise each day, try a brisk walk or some light cardio. ZONE 4 & 5 – KIDNEYS – Anything around your eyes, including dark circles is a sign of dehydration. Double your water intake, eat more cooling foods like watermelon, cucumbers and apples. Cut down on caffeine and alcohol. ZONE 6 – HEART – This could be from heightened blood pressure, get that checked out. Cut down on spicy foods and red meat and drink organic teas. Get moderate exercise on a daily basis, a little Zumba anyone? Maybe a kickboxing class… If you don’t have any issues with blood pressure, check out your make up and make sure it’s not past it’s expiration date because our pores a very prone to clogging in this area which could also lead to more breakouts. ZONE 7 & 8 – KIDNEYS – Again be sure to drink more water, if you find that your ears are hot it may be due to over consumption of caffeine and alcohol. You can also try to cut down on salty foods to solve problems in this area. ZONE 9 & 10 – RESPIRATORY SYSTEM – Smokers or people suffering from allergies will often find that they are more prone to break out in this area. Fresh air and exercise can help keep these areas clear. Another major culprit could be dirty pillowcases or a grimy cell phone. Clean these things and you may start to notice a difference. I’m a huge Lysol freak, so you can find me spray my cell phone from a far once or twice week. Avoid caffeine, fatty foods and alcohol. Grab some fresh air and a bit more exercise. ZONE 11 & 12 – HORMONES – Hello Aunt Flo! This is the main area that breakouts will pop up when your hormones are crazy. They can also be caused by late nights and climate change. Drink more water, get enough sleep and eat some big ‘ol leafy greens to fight acne in this area. ZONE 13 – STOMACH – Drink some herbal tea, get more fiber in your diet. Exercise more regularly. Try taking a fish oil supplement on a daily basis and grab a bit of light exercise. I think when you look at your acne this way, it definitely gives you more tools to add into your daily life to combat in your on going war with acne. I try to target each area individually if I find that I’m beginning to notice more breakouts in one of the specified areas. I really love this post. I found it very useful, I have suffered from acne for years so it is good to see what might be causing the problems. WOW, you hitting me hard there, but truly this is fascinating!! This was SO helpful!!! Thank you so much! What a great post! I am pinning! Thanks for linking up last week at Made in a Day! Stopping by to let you know I am featuring you tomorrow on Made in a Day! Stop by and grab a Feature Button! You deserve it! This is such a great post. Very insightful too. As the old saying goes, you learn something new everyday! This is equal measure fascinating and useful! It is great to learn how to listen to what your skin/body is telling you. Great post! Hope you can stop by the enchanted oven to say hi. Thanks for sharing this! I think I need to leave caffeine alone and drink some water! Thank you so much!!! You made my day!! I’m glad you enjoyed, everyone!! Thanks so much! !